Since the iPad’s 9.7-inch display is relatively close in size to a drum head, it makes the device a natural candidate for percussion apps. Enter the DjembePad: an app that emulates the Djembe African hand drum. The Djembe is a traditional West African hand-drum typically made of wood and goatskin. While they’re a blast to play, real Djembes typically cost upwards of $100, are quite large and cumbersome to carry around, and won’t make you popular with the neighbors. 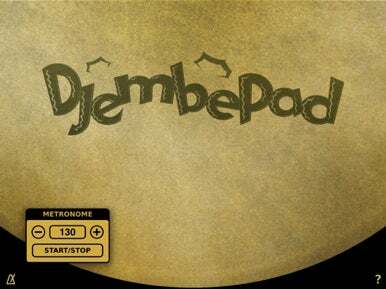 The DjembePad aims to give you the benefits of playing a real Djembe, without the downsides. It features realistic samples of the Djembe’s slap, tone, and bass sounds, as well as woodblock and cowbell samples for extra spice. The app also provides loudness and tone controls, and a metronome to sharpen your rhythmic abilities. The app’s interface is an image of half of a Djembe drum head. To play it, you place the iPad in landscape orientation on your lap, and then tap the virtual Djembe with your thumbs—although you can also use all ten fingers to achieve quicker, more intricate rhythms. As you tap closer to the rim of the drum, the sound becomes increasingly reverberant, much like with a real drum. DjembePad runs on iPad running OS 3.2 or later and sells for $2—a small price to pay for the ability to join an iPad drum circle. Check out a video of the app in action below.